Anonymous, 10 Aug 2012no..u cannot play youtube videos :( only can dwnload it wid 'youtube downloader' software and ... moreeven that can suport stream (online videos like youtube) 2G cant support it like 6600, 3230 etc. Must be 3G compatible fone atlease UMTS, asha 311 HSDPA good internet and stream! i tested this phone yesterday.. very slow response to touch . i changed my mind. i wont buy it.. should have been capacitive touch.... you have to touch the icons twice to get a response..
some time it hang on surfing net, sometime get a memoryful msg for deleting some data. but over all a good dual sim set. Chaku, 10 Aug 2012Youtube not play in any dual sim phone.if any tell me.why not, you can try samsung c3752 slider phone. it is dual sim set, 2.4" screen, good battery back up you tube supported. very good sound quality. price is near about rs.4800 inr. 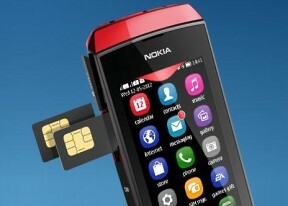 hey where is andriod in the nokia ???????? chintu, 10 Aug 2012hey am unable to play youtube videos...please can any body help memaybe u need to convert the video into another format such .wav or else. hi i m going to buy this set ,is there in specify problem in this phone???? ?kindly guide ..
can anyone tell whether we can create groups for contacts..! how many contact numbers can be added to a group..????? Youtube not play in any dual sim phone.if any tell me. Sahab, 09 Aug 2012Friends plz plz plz tell is this fon is symbian or not and the you tube in this fone.....?its nt symbian..it works on nokia s40 version.